I can't tell you how many times I've been at the supermarket & wished I'd had this tool. Of course you'll need an iPhone for this one. 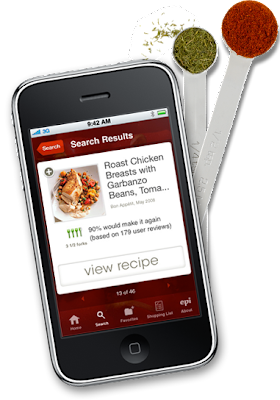 I use Epicurious all the time & now I have it on the go! Another great application for the Iphone is called Measures (They also have one called Units), where it will convert units of (Oz into Cups.... or whatever measurement you need). I always get frustrated when I write down ingredients and go to the store and they sell it in a different unit, this solves the problem.